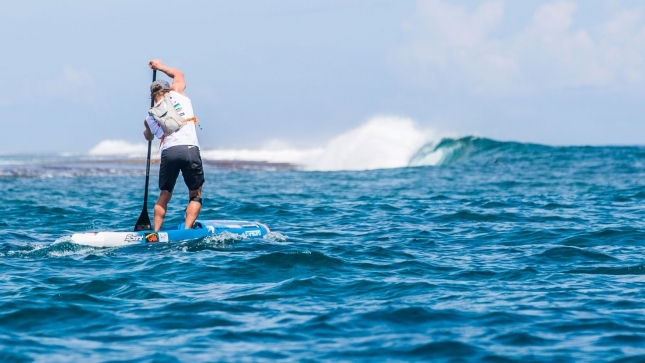 Marcus Hansen has announced himself as a genuine contender on the international stage, producing a stunning comeback for Team NSP to overpower Starboard’s Michael Booth and defeat a big field of Tahitian Warriors at the Air France Paddle Festival. As the first stop on The Paddle League World Tour, the 5th Annual Air France race drew a strong international crowd to compete against the Tahitians, and the battle royale didn’t disappoint. With weather that can only be described as too good, paddlers were met with mercilessly-hot blue skies, light winds and high humidity for a challenge that tested both physical and mental limits. But in the end it was Marcus who conquered the torture chamber, saluting in an event that produced several rollercoaster stories. The journeyman paddler – long recognised as a great talent but with a résumé light on big results – was somehow able to conserve energy for the first two hours before mounting an extraordinary campaign down the home stretch to first reel in then break the powerhouse that had motored away in the second half of the race. After a disastrous EuroTour last year, many of us wondered whether Marcus would even continue paddling at the highest level. But not only as he bounced back from a disappointing 2017 season, the humble Kiwi has found an inner-strength that’s propelled him to the pointy end of the international field. 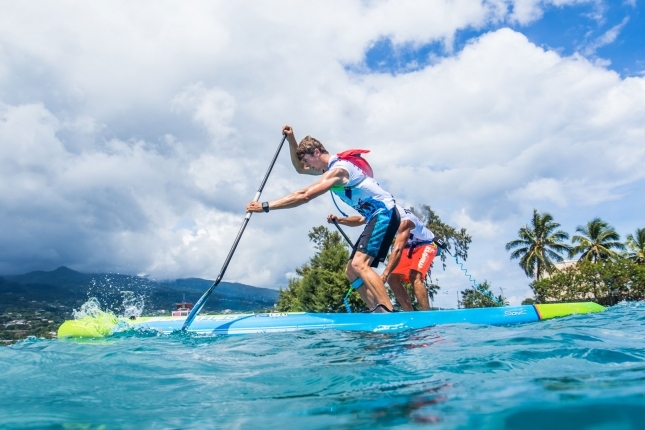 His victory in Tahiti this weekend adds to impressive showings at The Paddle League pre-season events on the Gold Coast and at home in New Zealand, where he successfully defended his national title. Our money was on his NSP team mate Titouan Puyo before the race, but Marcus is clearly determined to move out of the shadow of Titou and fellow NSP giant Travis Grant. Boothy looked certain to seal the 100 Paddle League points as he cruised home with a lead that at one point was almost 200 metres, but right when most paddlers were starting to falter, Marcus found a hidden gear and started paddling like a man possessed. With a cadence that wouldn’t have looked out of place in a 200 metre sprint, the New Zealander powered home to record a breakout victory in one of the greatest performances we’ve ever seen. 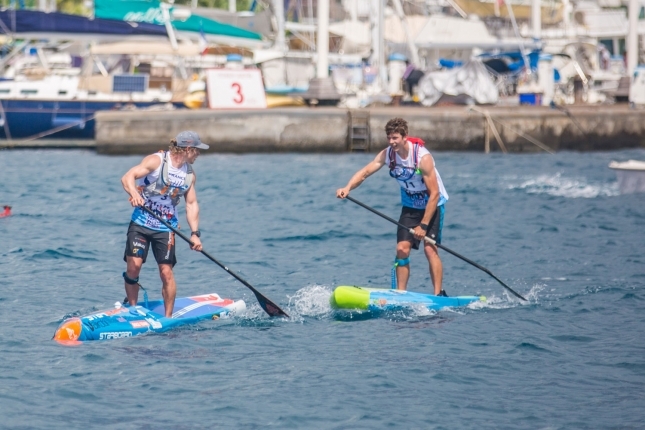 The pivotal moment came when Marcus caught the race leader: instead of simply sitting on his tail and waiting for the final 100 metre sprint to the line, Marcus soon streamrolled past a broken Michael Booth with a half a kilometre still left to paddle. When the Aussie, who was clearly running low on energy at that point, symbolically looked over his shoulder for a second time in the space of a minute to see who else may be closing in, it was a sign of both frustration and resignation that the race was lost. Boothy, while disappointed to relinquish a big lead so close to the death, was in superb form and can take heart form his surging performance. Despite running out of fuel when it mattered most on this particular occasion (he was utterly exhausted and collapsed in pain shortly after the finish), the number four seed will clearly be a serious challenger for The Paddle League World Title after proving once again there’s nobody on his level in terms of pure paddling strength. The Australian also showed strong passion for the sport when asserting that the chase pack was getting a “free ride” from the flotilla of boats following the action. While it was indeed a washing machine at times, which made life difficult for some of the competitors, the spectator craft generally all observed the new 25 metre distance rule introduced by the Tahitian government last week (only media/security boats were allowed closer). Things could certainly be improved on that front – Tahiti has a unique history of boats closely following ocean races that seems foreign to the international athletes – but take nothing away from Marcus’ extraordinary win, because that was a herculean performance that came from pure heart and determination. Marcus now holds the number one spot on the World Rankings, which are reset at the start of each season as we transition into The Paddle League era. Marcus sits on 135 points from one major and two regionals, while Boothy is right behind on 115 following a win at the 4-star 12 Towers in Australia last month. The new-look leaderboard will be revealed this week. But while the internationals scored the top two spots, Tahiti’s army charged home to claim seven of the top ten positions and cement the nation’s reputation as a paddling power. 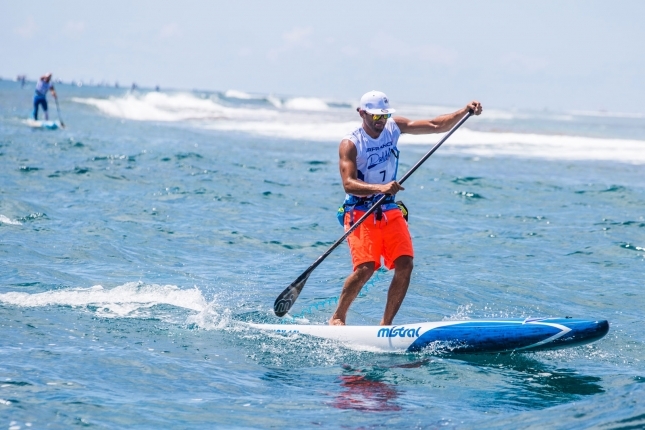 Team Mistral’s humble star Steeve Teihotaata led the fightback, crossing the line third and earning 60 points for The Paddle League World Rankings. 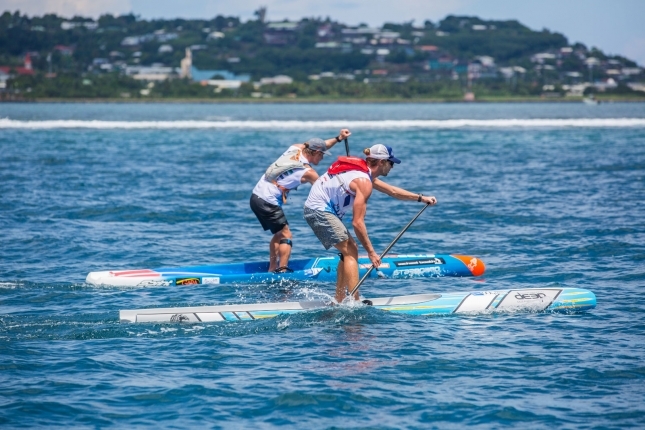 Earlier in the day, the Air France Paddle Festival’s 24km elite race looked set to be a showdown between the “big three” of Boothy, Lincoln Dews (Team DEEP) and Titouan Puyo (Team NSP). Local dark horse Hapowa Mai attacked the field early before settling back into the chase pack, while Enzo Bennett from the local 425Pro team was also at the front of the field for much of the race. But as the piercing sun began to drain the athletes, Boothy made his move around the 12km mark where he paddled away from Lincoln and almost instantly opened up a lead that he would retain almost right to the line. Those of us watching expected either Titou or Lincoln to make one last surge and keep the race interesting, but the role of comeback king fell to the under-rated Marcus, who had been sitting and waiting for the right moment to strike ever since rejoining the lead pack around the 5km mark. Behind the frantic fight between the top two, the rest of the field was scattered as the long, hot, grind of a race started taking its toll in the closing stages. After looking certain to finish runner-up, Lincoln limped home outside the top 10, while on the flipside, many of the Tahitian warriors only found their strength as the race clock ticked over two hours. Steeve, a local legend from outrigger canoe (or “va’a” as its known locally), showed the greatest strength to power past Titouan in the final kilometre, while ultra dark horse Manatea Bopp du Pont (Team Sunova) snuck home to repeat his fifth place finish from last year–an extremely impressive feat considering the dramatic increase in international talent this year. Lincoln, while disappointed to finish 13th after setting up such a strong campaign, can take a lot of confidence from his impressive showing for the first 20km of the 24km race. Linc was the only one able to match Boothy during the long, pivotal back straight on the outside of the reef, and he’ll be another one to watch in the hunt for this year’s World Title. Enzo Bennett, who looked impressive all day despite being better-known as a short-course athlete, gave Team 425 two of the top six spots after he crossed the line just 10 seconds behind Manatea. One of the local favourites and another va’a grand champion, Rete Ebb, saved enough energy for the final stretch, mowing down several of the international athletes en route to a solid 7th place finish. Early race leader Hapowa Mai crossed in 8th ahead of the former Tahitian powerhouse Georges Cronsteadt. Georges has helped forge a path for Tahitian stand up paddlers over the past decade, but it seems he’s now had to begrudgingly pass on the torch to the younger athletes. Niuhiti Buillard, who was briefly sitting in second place after a spirited attack 5km from home, rounded out the top 10 in a fine performance from the local athletes. But one of the biggest stories of the day was the performance of 13-year-old Keoni Sulpice, who eventually finished 11th but showed why he’s a future champion after sitting in the top five during the mid-part of the race. The super grom was briefly the lead Tahitian despite being less than half the age of his peers, and if it wasn’t for the fact he drained his water pack with 10kms still left to race, Keoni probably would have secured a place well inside the top ten. 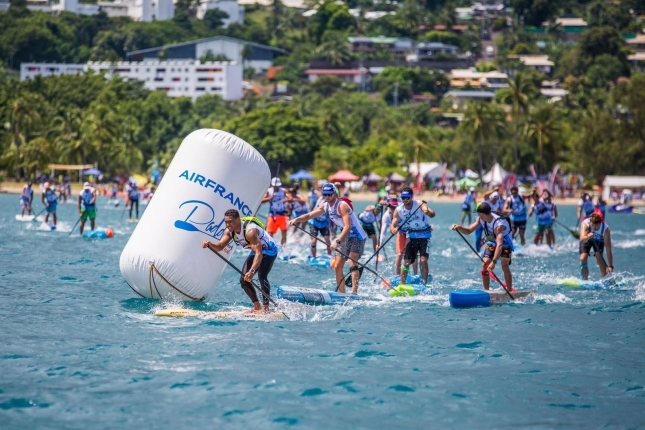 The Air France Paddle Festival lived up to its reputation as a brutal challenge, with many internationals fading under the relentless South Pacific sun. Lincoln Dews lost almost a dozen places in the space of 15 minutes, while other big names such as Kenny Kaneko and Noic Garioud were hovering around 20th place. But the biggest scalp of all was number one seed Connor Baxter, who faded early before abandoning the race entirely. The race was broadcast live on national TV with our partners Tahiti Nui Television, while the event also featured stringent anti-doping controls to produce arguably the most professional event in the sport. Earlier in the day, almost 200 amateur paddlers took part in the lagoon race with several dark horses testing their talents and earning both bragging rights and a few free Air France plane tickets. It was a massive day on the water, and a great start to the 2018 Paddle League World Tour. Thank you to Air France and the organising crew from 4 Events Pacific for putting together such a great day on the water, and a massive “Maruuru roa” to everyone in Tahiti for welcoming the paddling world to paradise. Thanks to everyone that tuned in on The Paddle League live stream: See you all in Carolina!